It’s estimated that the average person uses 500 plastic bags per year and recycles only four or five of them. With over 500 billion plastic bags discarded every year, it’s no wonder that the demand for an alternative is skyrocketing. And your purchase of a tote bag can give back in ways you never imagined. With the holidays approaching, giving the gift of a tote can do more than reduce the plastic bag pandemic; it can support a variety of nonprofit organizations covering environmental, social and global causes. Everybodygreen.com — Recycled Pear Bag: This fun-loving tote is made from recycled plastic water bottles. 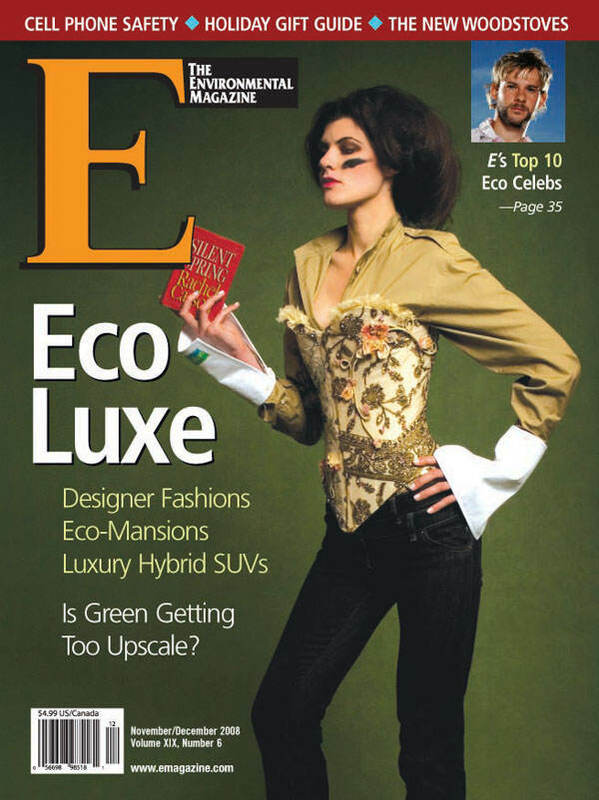 Coupling eco-fashion with a campaign that donates to a number of nonprofit environmental organizations including Oceana, Earth Resource Foundation, The Clean Water Fund and Heal the Bay, Everybodygreen.com aims to raise one million dollars by the year’s end. The Recycled Pear Bag is sold in packs of 10 ($19.95). Another offering from this forward-thinking group, which touts fans worldwide, is The Reuse Bag ($4.95). With six brilliant colors to choose from, this tote also comes with its own pouch and hook for easy storage once the workday is done. www.everybodygreen.com. FEED 100 Bag: Created by Lauren Bush, cofounder and CEO of FEED Projects (and niece to our 43rd president), each purchase ($29.99) provides 100 nutritious meals to schoolchildren in Rwanda through the United Nations World Food Programme. Sold exclusively throughWhole Foods Market, the bags are fair trade and made from organic burlap. According to Bush, “Creating the FEED 100 bag was inspired by the need to take better care of children and the planet at the same time.” www.feedprojects.org; wholefoodsmarket.com. My Bag Cares—: This generously sized tote is a must-have for the tree lover on your list. For every My Bag Cares purchased, a tree is planted in fire-ravaged areas of our national forests. Nearly 17,000 trees have been planted through the Arbor Day Foundation. The bags are made of linen and untreated natural cotton. Every My Bag Cares ($25) is also shipped in a 100% recycled box and includes a thank-you card for your recipient (printed on recycled paper, of course). www.mybagcares.com. Friends of Al: The New York design team Hayden-Harnett offers this natural canvas tote with a funky graphic printed in all-natural pigment inks. Each sale sends $25 to various global warming charities and $10 to American Forests to plant 10 trees ($55). Also from Hayden-Harnett is the Green Is Good organic cotton tote ($27) with 100% of its proceeds benefiting Farm Aid. www.haydenharnett.com. Bazura Bags: This Canadian-based company offers several attractive shopping bags, including the Banner Shopping Bag ($29.95), made from recycled Filipino advertising banners, and the Colored Shopping Bag ($34.95), which incorporates recycled juice pouches. Purchases help sustain the Women’s Co-Op of the Philippines while reducing vast amounts of waste material from the landfill. The Co-Op’s new Scholarship Fund will help aid children of the women members with their post-secondary education. Bazura has pledged 5% of its total purchases on a yearly basis. www.bazurashop.com. What’S ur bag’s its-laS-tik— HOPE NOLA Tote: Made in New Orleans, in a factory destroyed by Hurricane Katrina and rebuilt by survivors, 5% of sales goes to Hope House Charity in New Orleans. Made of nylon and spandex, the fabric allows the bag ($14.99) to stretch and assume the shape of its contents. The bags are washable, reusable and economical. And, once your HOPE NOLA tote has seen better days, just send it back to the company for a discount towards your next purchase. The worn bags are sent back to the factory to be shredded and reused. www.whatsurbag-usa.com. ECOBAGS°and DoSomething.org “I Am What I Do” Tote: DoSomething.org is the nation’s largest non-profit dedicated to em-powering young people to take action on environmental issues. www.DoSomething.org and ECOBAGS have teamed up to spread the word that eco-friendly, reusable bags can be not only practical but encourage social action, too. Five dollars from every recycled cotton canvas tote sold ($14.99) is donated to DoSomething.org. ECOBAGS also offers “Bring Your Own Bug” bags ($14.99, butterfly, spider or grasshopper motifs) with 20% of proceeds benefiting MS research. The tongue-in-cheek “Nothing on Me Is Plastic” tote ($16, limited edition) is printed on certified-organic cotton and supports the Environmental Media Association. “We are actively seeking to partner with other groups whose missions are aligned with ours,” says Sharon Rowe, CEO and founder of ECOBAGS.Additional “totes with quotes’ and hundreds of other eco-friendly items are also available. www.ecobags.com. Envirosax° Organic Series: This “zen-sational” 15-piece series boasts bags made of bamboo, hemp and linen. Designs are infused with Asian art and landscapes in a color palette of deep reds, rich plums and calming neutrals. Each stylish bag ($24.95) holds the equivalent of two supermarket bags. With each purchase, Envirosax donates a percentage of its sales to the Australian Marine Conservation Society, Surfrider Foundation, American Cancer Society and the Royal Forest and Bird Protection Society of New Zealand. www.envirosax.com. Pangea Collection: It’s nearly impossible to imagine the horrors of surviving December 2004’s tsunami in Thailand. Four years later, survivors still face the daily task of rebuilding their lives. Pangea Collection is offering the Eco Cotton Shoulder bag ($35) made by members of the Saori Project, a Thailand-based organization that aims to give survivors spiritual therapy and a secure and steady work environment. These handmade, fair trade bags utilize raw materials and dismantled threads, which are then woven together to create original, vividly colored works of art. www.pangea-collection.com.